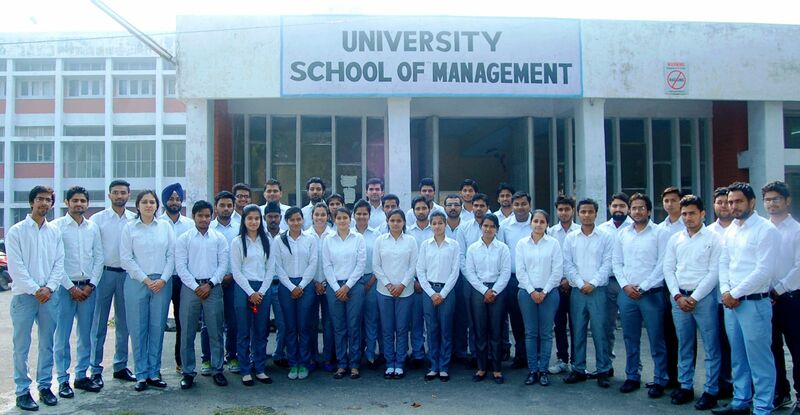 Ever since it came into being in 1973, the University School of Management (formerly Department of Management), Kurukshetra University came into being is focused on imparting quality education and skill training in all functional areas of Management such as Production, Marketing, HR, Finance, IB and IT. Very recently, it added three course verticals – Agri-business, Entrepreneurship and Business Analytics to stay on course in the transient and transformational times. As of now, it facilitates said course verticals in a two year full time MBA frame with 180 capacity intake. Students trained and groomed at the USM are readily accepted by the corporate sector as are getting opportunities and are placed with during their course of study in large numbers. Over time, it has nurtured and nourished a very rich alumni network over the years that shoulder leadership position in different facets of business and social life today in India and abroad today. Academic life remains full of action at the University School of Management during the entire academic session. It reverberates in every Student, Teacher, Scholar and staff. Invited speakers from industry and academia also cuddles with students in different roles and responsibilities with support of technical, ministerial and supporting staff to enjoy seasonal vagaries at this beautiful campus, the Kurukshetra University. Nevertheless, the School is equally sensitive to its role and responsibilities in the transitional and transformative India. In order to stay abreast with this, it intend to further strengthen existing course infrastructure with thought puts in the Finance (Fintech, risk management, risk and credit analytics), Marketing (Logistics and supply chain, digital and social media marketing and analytics), HR (Competency mapping and HR analytics) and strengthen compliance and governance in the Strategy space. The University School of Management (formerly Department of Management), Kurukshetra University, Kurukshetra is committed to the quality education, training and skill development in a transient and transformational times. It aspires to be instrumental in ethical and socially responsible reshaping young minds amidst present day weird and technologically disruptive business and work environment. The School recommits itself to further strengthen alumni and corporate interactions and to leverage it to empowered internships and placements to the students and wish to leapfrog this learning to seek and have access to CSR funds to build and strengthen infrastructure. In this perspective it also endeavors to institutionalize governance to minimize human interface.